Do you know the secret of the best shots? Almost all photographers use it in their work, intentionally or not. What this secret is? Shoot more. Yes, that is it. Just take more pictures and choose the best ones from the series. Pro-level cameras even have a special shooting mode for that: multi-shot, continuous shooting and whatever other name it has. However, even if you take photos with conventional digital cameras you end up with a number of duplicate photos. The same scene shot from slightly different angles. Same portrait with varying gestures, expressions and poses of the subject. Multiple photos you take in an attempt to catch the best picture of a moving object like car, animal or kid. So, how do you remove all those duplicates and similar images in a single run? With DuplicateHunter, of course! Run DuplicateHunter and browse for photo locations by clicking the Select button on the toolbar. DuplicateHunter offers two ways of searching for doubling photos: similar content and close timeline. Since we need to find duplicates of continuous shooting, select the Timeline mode on the toolbar. This will make DuplicateHunter to group similar photographs based on EXIF date and time. If the photos were taken in a short time interval between them, the program considers them as duplicates and groups accordingly. Now as you see all duplicating photos, you simply need to pick the best ones from each group. Mark the images you want to save. You can preview each image at the right side of the program. 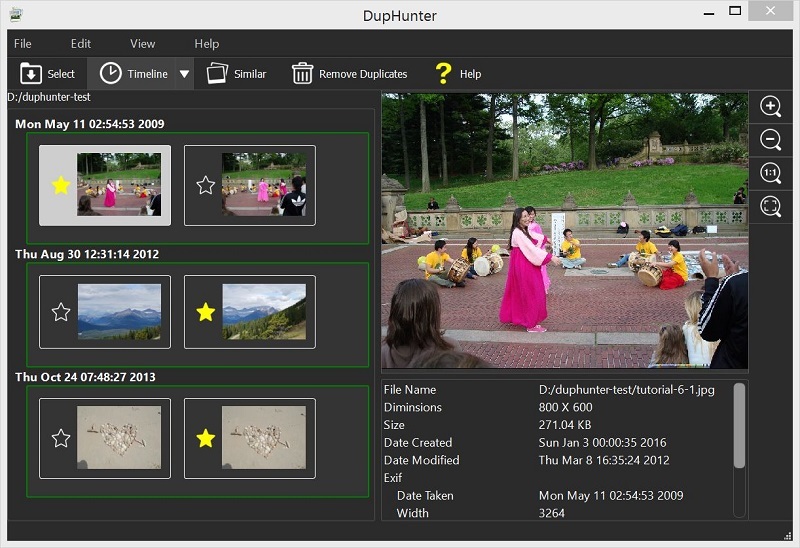 DuplicateHunter also shows EXIF information for the selected photo: file size, date and time of shooting, resolution and dimensions. When you mark one or more photos in a group, its border becomes green indicating the duplicate issue for this group is resolved. We are almost done here. Now, simply click the Remove duplicates button on the toolbar and DuplicateHunter will scan resolved groups and remove all similar images in them except for those you have selected as best on the previous step. All duplicate images will be moved to trash.